Rumours regarding the Nokia X2 began showing up just recently and today Nokia has actually announced the its second generation device of the X-line (not including the Xl and X+). Following the success of the Nokia X, Microsoft’s Devices and Services Group (better known as Nokia) looks geared to capitalise on the entry level market even further with this device by offering a new glossy design, UI enhancements and a specifications bump. The Nokia X was released back in March of this year so it came as a big surprise when the company chose to announce the follow-up in just three months. The device runs a forked version of Android so it does not have access to the Google Play Store however Android applications can be side loaded and run via third party app stores. The official specifications listed on Nokia’s website state that the device comes with a dual core Snapdragon 200 processor clocked in at 1.2GHz backed by 1GB of RAM, a 4.3 inch 800 x 480 ClearBlack display with a pixel density of 217 ppi. On the back there is a 5-megapixel camera with an LED flash and autofocus while on the front the X2 sports a new front facing camera dubbed “perfect for Skype” (the Nokia X lacked a front facing camera) along with a back button and a home button (new addition to the X2). The device comes with 4GB of on board storage and is expandable using a microSD card to 32GB. The X2 has dual SIM card slots and packs an 1800 mAh battery. The software experience of the X2 has received a boost. Swiping to the left displays an application list similar in nature to that of Windows Phone whilst swiping to the right brings up a new and improved Fastlane – a glorified rendition of Google Now. The main home screen can be customised by changing the colour of the tiles and resembles Windows Phone. There is access to quick multitasking via the back key as well. The X2 comes bundled with some free Microsoft goodies like Skype and One Drive and also provides free voice-guided navigation using HERE Maps. 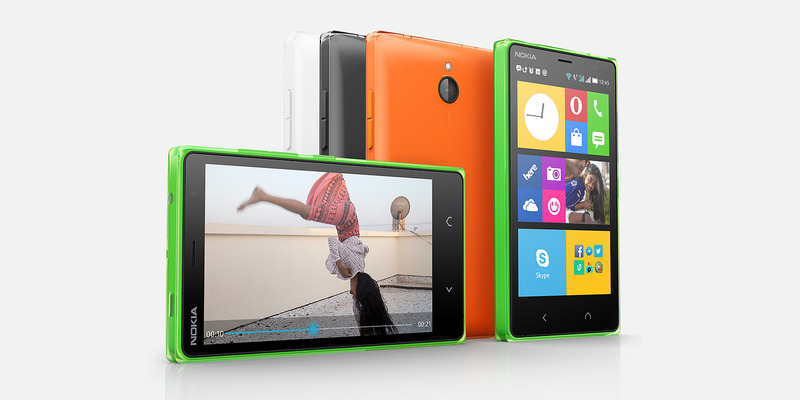 The Nokia X2 is slated for immediate release in some select countries and will reach other markets soon after. It will reportedly retail for €99 coming in glossy green, orange, white and matt black.